From this Friday on, another new monthly series is going to start on Barefoot in Luxembourg about best recommendations for each area of the city – and eventually also out of the city sooner or later. I based my suggestion on what I am doing normally and on my favorite places. Feel free to comment with your own suggestions, I am always happy to know new places! I am starting with the Gare – Station area, as my office is just overlooking one of the most busy street of the city and it is here that, normally, I spend most of my time when in town. I love this place for two reasons: first, you can go there whatever time of the day it is. For an overindulging breakfast, for a colorful lunch, for an afternoon meeting with tea and cookies or Saturday brunch . Secondly, it is the only place where I fancy having cupcakes. I tend to eat not too many sweets, because I don’t really like cakes, biscuits, macarons (sorry!) and I am more a burger and chips girl, but Kathy’s cupcakes are just perfect. They have lovely combinations (smors are my best!) and they are not soo sweet. Also: non-lactose milks – and soya, rice, etc – available for your drinks! Even if I am not very much into this restaurant for lunch, I love the tea room settings and above all on Saturdays it is perfect for a coffee break, a snack and some chats. Bonus point: very amiable service. When my sister was working in my same building, this was our usual lunch place. I love the fact you can choose between several different type of foods: from focaccia and lasagna, to soups, to sandwiches to salads. And everything is “natural”, with ingredients well written so whatever allergy or food preference you have you shouldn’t ask twice the waiter. My favorite dish there is the Thai Spicy Soup with mushrooms , they also have pretty good deals for lunch (salad, sandwich and drink for 8,40 Euro) and if you are in a hurry, the fruit-shake with watermelon and mint is just delicious. I started to hate sushi chains when I was in London, as I normally find the food there extremely cheap and insipid, and the opening of Sushi Shop in Luxembourg couldn’t help me to change my feelings – even it worse them. Sushi and More is a quite different story, as they have some well presented sushi, tasty, and the combinations for lunch (sushi box plus salad plus soup) are all for 11.20 Euro. They have also several “out of menu” items while my beloved box is the chirashi one. The location is clean and waiters are smiling and kind. Not for a date, but definitely worth a good lunch. Talking about good deals, Sushi Ogasang is a more refined place – I keep it normally for my “special” lunches. They have several lunch bento box formulas (around 14 Euros), including a vegetarian one, and, boys will be boys, an All-you-can-eat trail (15 euros for lunch, 22 euros in the evening). When I enter in Hema, normally I feel the same then when going to Ikea. I know I have to buy only a small thing (like the cleanser for my contacts) but I end up always with my bag full of stupid things. In fact I think Hema is helpful in two ways: for cheap home things (we bought there our curtains, but they have also dishes, small electro stuff, towels) or for totally silly compulsive items, like colored notepads, cake kits, gardener tools, candles. And… have you ever tried Hema cookies? Here at La Pause du Gourmet not only you can have delicious lunches (not on budget), refined wine tastings or organize your evening events (business nights, birthdays, dinners), but also buying amazing wines, cheese and charcuterie. My favorite is the truffle cheese (prepared with truffle bits, not just aroma) and the pesto one. Hubby is a fan of all the Italian charcuterie, including the Colonnata lard. Monoprix is open until 7 pm on Sundays (all Sundays, not only those of city-shopping) They have great fruit and vegetables selection, wines and champagne, fresh bread and croissants, meat, cheese, cleaning stuff and many more other products – and your final bill will be lower than driving to the next petrol station to buy some last-minute beef filet , Cabernet and chips. I know pretty well the station area is not popular among professional expats and Luxembourgers. It could happen anyway that you want to stop by the way for a drink, so, the Hotel Park Inn is definitely the best place to go for me. The ambience is swanky but not posh (forget Sofitel! ), the service friendly and the prices reasonable. Above all, you are on the first floor over Avenue de La Gare, so you can enjoy the chaos without being in it middle. Recommended for an after-work drinks. They offer a very good Italian style tiny pizza at reasonable price – I am not a fan of their other dishes and I would recommend personally to go there only for the pizza, but feel free to try and let me know! The environment is a bit messy but pleasant, with efficient service. If you stick to the pizza and beer menu, it is very reasonable priced. For having a beer at QG, you definitely do not need to dress up. They have plenty of space for chatting, a terrace, a pool table and they are open until 3 am over week-ends. It is not a fashionable place, but it is kind of place where you can spend a funny evening with your friends without being bothered about the surroundings. I love their Bloody Mary. 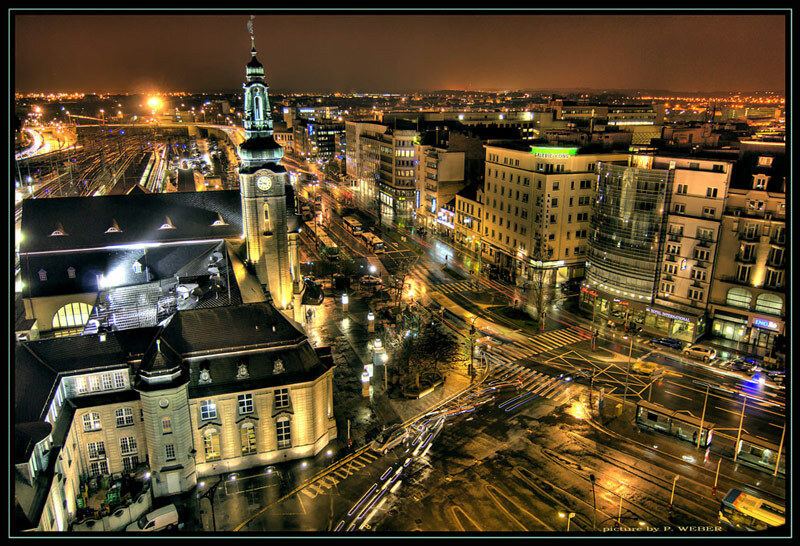 Good recommendations; it’s nice to have a little overview of the areas of Lux City! Thanks for the tip! In fact I passed there in front several times but supposing it was some kind of cheap noodles place I have never entered! I will! Thanks Vanessa, it was always too busy when I tried to get a place! I will try it next time! Great hints! I like a lot natural food and Exki is a place to go for sure. Loving following your blog, by the way! Thanks dear for your nice comment! I will get in touch with them in case!